When I walk in the street families folded in their homes have always fascinated me. Other lives are so close, yet so far away. A curtain, the distorting glass of a window is the only thing that separates us from each other’s intimacy. Lonely square of colour by Elsworth Kelly. The passage from conversation to silence is sometimes brutal. Driving back from a friend’s house on a cold night, one is suddenly alone with the words one has said, spilling around the car as one’s own presence wells up and our friends’ presence ebbs away. Their house, their furniture, their animals – the sweetness of it. Their cups, their floorboards seem like the lost world of the Proles in 1984 by George Orwell. Sometimes affection gives one the feeling of being transplanted. As a child I used to have the same nightmares. One of them was about big squares of different colours with rounded corners that would come timidly, fearfully, tantalizingly close to each other, but never be able to intersect or overlap. The feeling this awoke in me was the nightmare in itself. It filled me with suffocating fear. I can still remember the passionate unrequited tenderness and loneliness of those squares of colour. 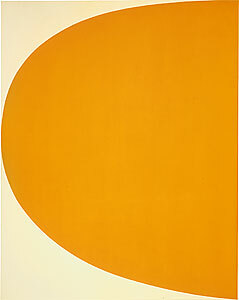 Elsworth Kelly’s solving of my nightmare. I then learnt Intersections in mathematics and, though I was nearly a retarded pupil concerning numbers, to the teacher’s stupefaction, I immediately found the answers. I knew it was my dream making me preternaturally aware of them. Others surround us but when we have inner connections with them, we can become hesitant squares of colour – hoping, hesitating, groping on invisible thresholds. Yet, isn’t that what true connection is about? Winston Smith sits in a dream of recognition in the Proles’ sitting room in 1984. His feeling of hidden wonder, his sharp living nostalgia so well describes what we feel when we try to connect. When quite by chance I stumbled on Elsworth’s Kelly’s paintings I recognised my nightmare, but it became a dream instead. No, we can never intersect. We are most certainly alone but in spite of wondering if we will ever truly understand another human being, we can approach them as tentatively as his squares of colour.